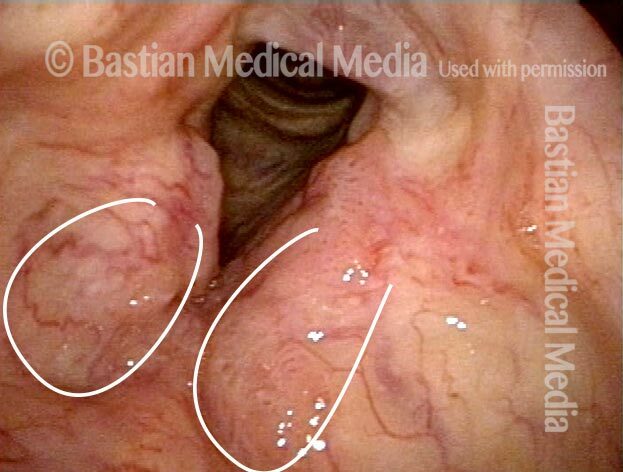 Papillomas at posterior vocal cords, with left side (right of image) much larger than right. This patient has HPV subtype 11. Closer view, under narrow band illumination, which accentuates the vascular pattern. Two weeks after microsurgical removal, cidofovir injection, and return of normal voice. 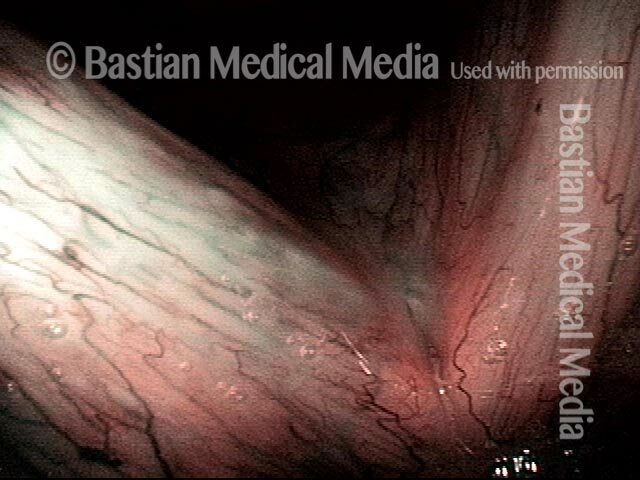 Closer view of left posterior vocal cord, narrow band illumination. Notice that there are a few dot-like vascular marks. These are typical of HPV effect, and may presage recurrence. Papilloma, left vocal cord (right of image), standard light. Voice is grossly hoarse. This patient has HPV subtype 6. Same lesion, under narrow band illumination. After removal and cidofovir injection, normalized larynx. Voice is normal. Same view, under narrow band illumination. Panoramic view, standard light, shows papillomas on the aryepiglottic cord, false cords, anterior face of arytenoid, and at anterior commissure. This patient has HPV subtype 11. Closer view, standard light, shows more clearly the papillomas on the anterior face of the right arytenoid and at the anterior commissure. Still closer view, to see more clearly the anterior commissure papilloma. Under standard light, faint stippled vascularity is seen, along with a general mild inflammatory response (pinkness). Patients like this are often misdiagnosed with acid reflux. Same patient, narrow band light. Now seen is the stippled, HPV-effect kind of vascularity of “carpet-variant” lesions. At initial diagnosis, as yet untyped for HPV. Multi-focal lesions on both vocal cords. Narrow-band illumination and a different viewing angle better reveal the more subtle lesion on the upper surface of the right cord (dotted circle). Strobe light, open phase of vibration, showing mismatch. One week after removal of papillomas, voice is dramatically restored. Strobe light, open phase of vibration. Compare with photo 3. Strobe illumination, closed phase. Even in falsetto, oscillatory ability is preserved due to the precise and superficial removal of the papillomas. At three weeks after removal, the patient regards his voice as normal. The patient has neither lesion nor vascular change to suggest any residual or recurrent lesion. Needle in photo (arrow) positioned to inject adjuvant medication in attempt to prevent recurrence. This procedure is done in a voice lab under topical anesthesia, not the operating room. After both cords have been “inflated” with adjuvant medication. Note the convex, slightly blanched vocal cord margins, due to superficial infiltration of the medication. Nearly a month later, immediately after the third and final adjuvant injection (hence the blood below the vocal cords). The patient again regarded his voice as completely normal. No sign at this early point of recurrence of papillomas or other HPV lesions. Patients with focal disease as seen in photo 1 of this series not infrequently go into long-term remission or “cure,” though it may be impossible to discern the relative roles of surgery, adjuvants, and the patient’s immune system. 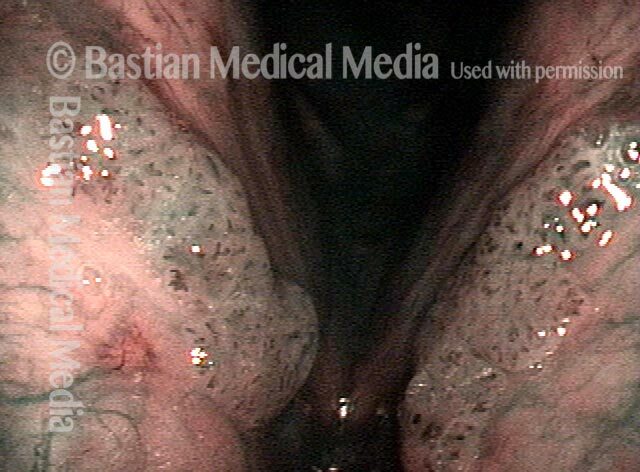 Papillomas of the vocal cords, in a patient with HPV subtype 55, which is intermediate-risk for progressing to cancer. Same exam, with narrow-band lighting, which accentuates the vascular pattern of the papillomas. Same patient, years later, in remission, and with normal voice. No sign of papillomas here or anytime during the prior three and a half years, after meticulous removal and Cidofovir treatment. Same exam as photo 3, with narrow-band lighting. The vascular dots on the vocal cords are not HPV-related. 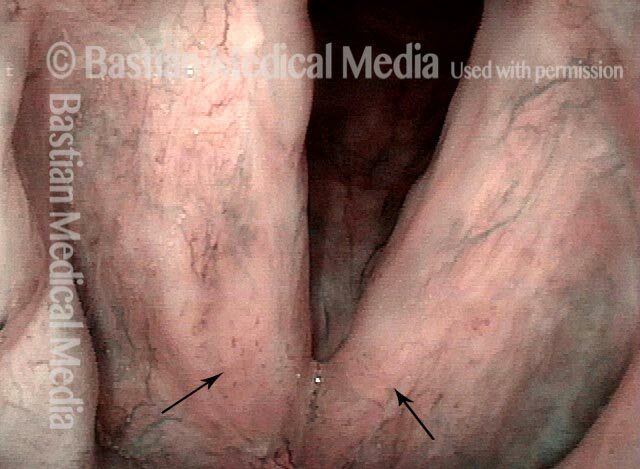 Vocal cords, narrow band light, showing papillomas on the upper surface of the anterior vocal cords. This patient has HPV subtype 11. Tracheal view, standard light, showing scattered papillomas (arrows). The carina is in the distance. Papillomas involving both the true and false vocal cords. At higher magnification, the stippled vascular markings become more evident. Papilloma growths on the right vocal cord (left of image), standard light. This patient's papillomatosis is caused by HPV, narrowed down to either subtype 18 or 45. Slightly magnified view of the same papilloma growths under narrow-band illumination, which accentuates the vascular pattern. Recurring inflammatory and leukoplakic lesions caused by HPV subtype 16. 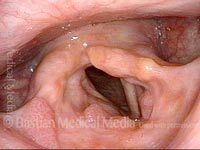 A left vocal cord cancer (right of image) was removed several years earlier, and the patient developed a right vocal cord cancer almost a year later. Slightly magnified view, focusing on the anterior (frontward) ends of the vocal cords. The cords' stippled vascularity, which often accompanies HPV infection, is more apparent here. A similar view to image two, but with narrow-band illumination, which accentuates the vascular pattern. Biopsy/removal of these lesions revealed high-grade dysplasia; re-biopsy almost a year after this examination returned a diagnosis of cancer. 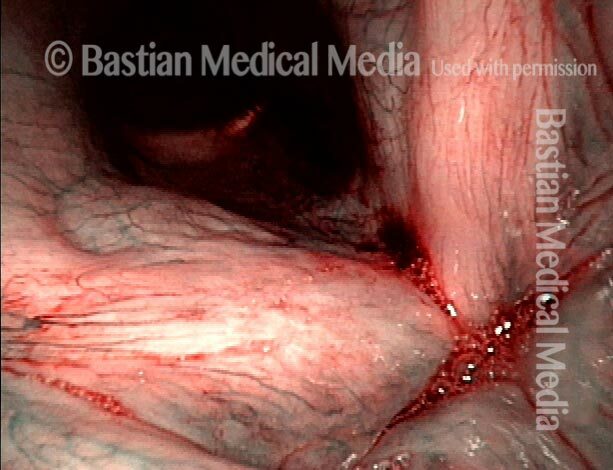 Standard light, showing lesions on the vocal cords, in particular the stippled vascular pattern we call "HPV effect." The patient's voice was nearly gone, with numerous syllable drop-outs and a very effortful quality. Compare with photo 3. Closer view, using narrow-band light to accentuate the vascular pattern of "HPV effect." Biopsy and additional testing of these lesions showed squamous papilloma with moderate dysplasia, and HPV subtype 31 was confirmed, which is high risk for eventually causing cancer. After the patient underwent several injections of cidofovir, the lesions persisted but seemed to become more indolent. On compassionate grounds, this fairly young person was then prescribed celecoxib for six months. Three years after photos 1 and 2, standard light view. Within two months of the start of celecoxib, voice improved very noticeably, and the "HPV effect" vascularity resolved. Still, it is unknown what roles in this recovery were played by the patient's immune system, the cidofovir, and the celecoxib, respectively. Closer view than photo 3, under narrow-band light. Cancer, in a patient with HPV subtype 16. 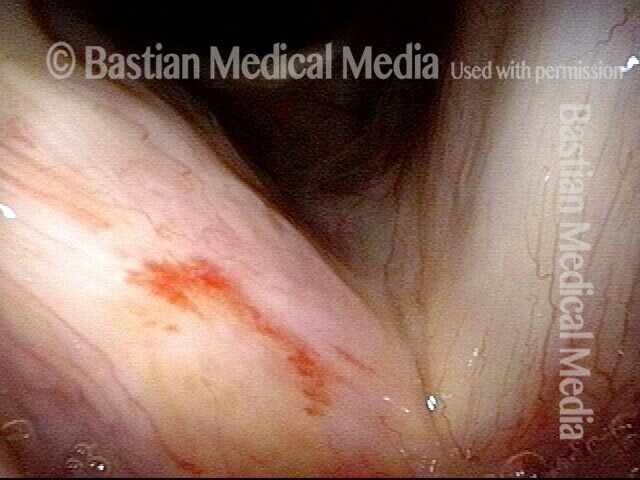 The divot and blood seen on the left vocal cord (right of image) are the result of a biopsy performed elsewhere (not by BVI physician) earlier the same day as this examination. Six weeks after the end of radiation therapy, the tumor is no longer seen. However, part of the left cord (right of image) is missing, due to sloughing of the tumor that had eaten away part of the cord’s normal tissue. Phonation. Strobe light, open phase of vibration, shows that the margin of the left cord (right of image) is at a lower level than the right’s, due to loss of some of the bulk of the cord where the tumor died and sloughed away. Strobe light, closed phase of vibration. 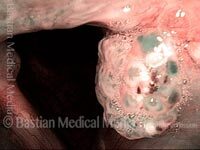 The more normal right cord (left of image) unsuccessfully attempts to reach the left cord’s residual upper surface mucosa. Voice is functional but hoarse. The papilloma is seen attached to the posterior tracheal wall, at the midpoint of the trachea. Note the areas of scarring from prior laser procedures. The dots seen indicate reference points for photo 5. Using the channel scope, a blue glass fiber is extended from the tip of the scope. In a closer view, the papilloma has been mostly cauterized using near-contact (not touching) mode. The papilloma is then penetrated multiple times to deliver laser energy to its base. Some of the papilloma is pulled off by attachment to the fiber, and the remainder will slough off and be swept upwards by the mucociliary blanket (thin layer of mucus being swept upward) within the trachea. Durable resolution of papilloma, many months afterwards. Compare with photo 1. After achieving a normal voice through several procedures, the patient came in for reexamination due to the return of mild huskiness. This distant panoramic view with standard illumination does not reveal any obvious papillomas. At close range, using narrow band illumination, a subtle but definite HPV effect is seen. Notice the stippled vascular markings and the faintly increased pinkness at the margins of the cords, indicated by dotted lines. With the vocal cords now at the pre-phonatory instant, these low-profile HPV-related papillomas are again seen, indicated by dotted lines. Panoramic view shows marked enlargement from tumor of false cords. Biopsy shows squamous cell and cancer HPV type 45 is also detected as the likely cause. 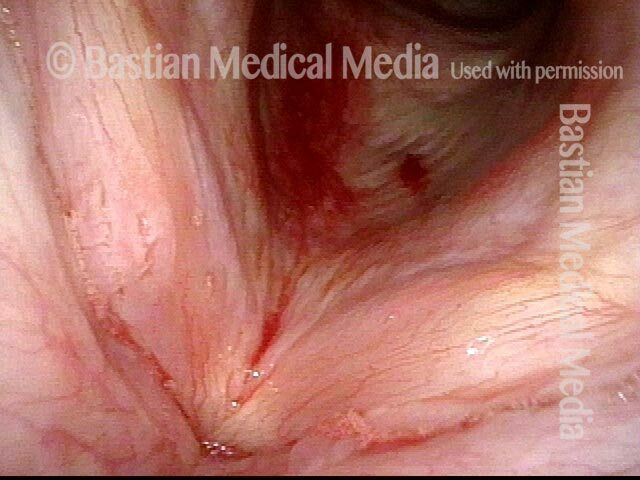 Closer view of the true vocal cords showing HPV effect of vascular stippling. Narrow band illumination accentuates HPV vascular effect. After radiotherapy with complete response. A glottic web is now seen as a radiation side effect/complication. Closer view of post-radiation web. After microlaryngoscopy and release of glottic web. Tumor is gone. Closer view of final result; patient has very good voice. Note that the HPV-related stippled vascularity is no longer seen. This 20-something nonsmoker without reflux symptoms is chronically hoarse. HPV infection is suspected for the following reason: While hazy leukoplakia can be occasionally seen as a result of excessive voice use, it would be most unusual to this degree, and this far lateral to the vocal cord margin. Biopsy shows only chronic inflammation, and HPV testing is positive for subtype 31. Several months later, the inflammatory reaction with leukoplakia remains. Narrow band illumination here makes the leukoplakia patches more demarcated. Within the circle, one can see faint HPV-effect on vasculature (stippling). Approximately one month after removal of papillomas and Avastin injection in a man who has battled aggressively-recurring disease caused by HPV, type 6. In this view using narrow band light, only two small papillomas are visible. At closer range, careful inspection shows no papilloma (yet), but only the stippled vascularity typical of HPV infection. HPV vascular effect is seen even more clearly. Papillomas in the supraglottis, left of image. The pink, velvety area of papillomas is outlined by small arrows. 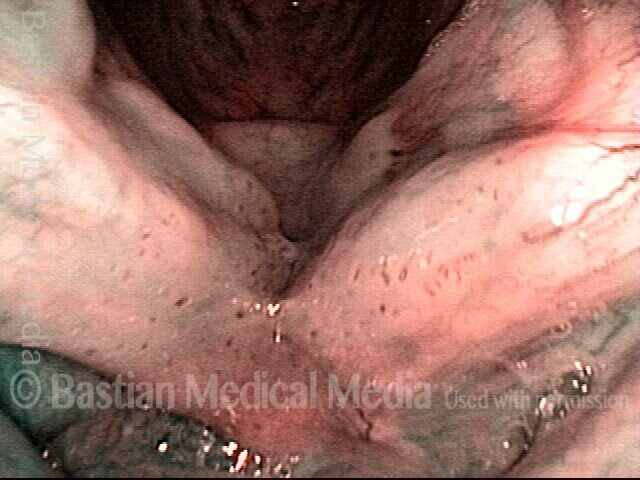 Closer view of the vocal cords, showing leukoplakia. This is presumably a second expression of the HPV infection, though the typical dotted or pointed vascular marks of HPV are not seen in the area of the leukoplakia. This young man had a tonsil problem and normal voice but during the initial head and neck examination was found to have a papilloma in his larynx. Rapid recurrence and spread triggered referral. Note stippled vascularity on masses along the edges of the false vocal cords. Narrow band light makes the papillomas much more evident. Under strobe light, closed phase of vibration, the true cords are seen to be uninvolved, and this explains his normal voice. Open phase of vibration, strobe light. The plan is definitive removal and HPV subtyping. Middle aged woman with a 6-month history of hoarseness. Note the left vocal cord lesion (right of photo at arrow). 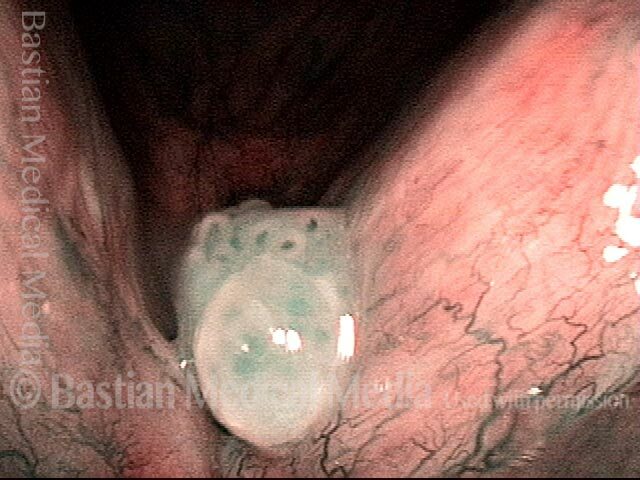 At closer range under narrow band light, the stippled vascular pattern suggests that this is HPV-related papilloma. Very tiny secondary lesions may be present at the arrow and ? A week after removal (and proof of HPV subtype 6), the left cord (right of photo) shows expected pinkness. 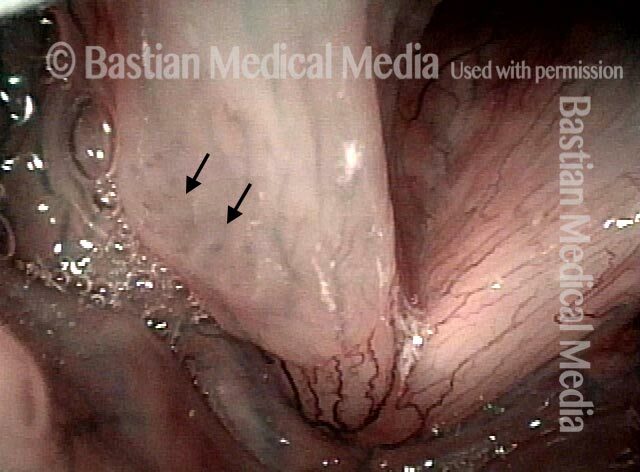 The tiny lesion under the right cord (left of photo) “escaped” and appears larger but is still not a verifiable papilloma, nor is the tiny lesion on the upper surface of the right cord (left of photo) at the ? Now 2 months after surgical removal of the original left cord lesion, that cord is healed and without evidence of papilloma. Voice is excellent—can pass for normal—but the tiny lesions previously seen are now verifiably flat papillomas (see stippled vascularity at arrows). Now 7 months after original surgery, voice remains “almost” normal to the patient. Cord margins match well with voicing. Irregular margins are primarily due to overlying mucus. 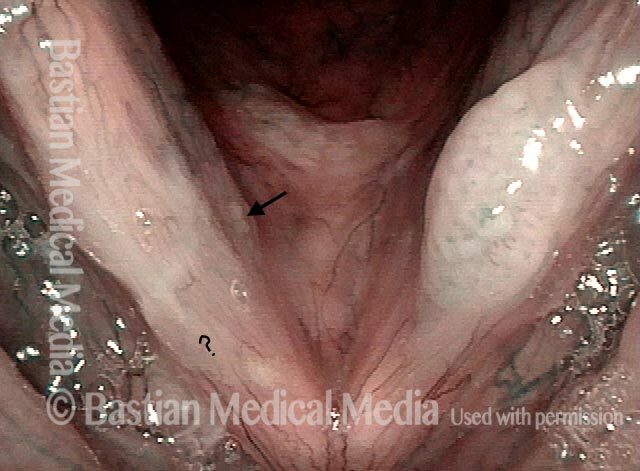 With abduction of the cords for breathing, a papilloma is seen below the margin of the right cord (left of photo at large arrow); the small arrows outline a peculiar “elevated” area that looks to be more than mucus the mucus seen at 'X'. Still under narrow band light, stippled vascularity in the area of the arrows suggests that this elevated area also represents HPV disease. 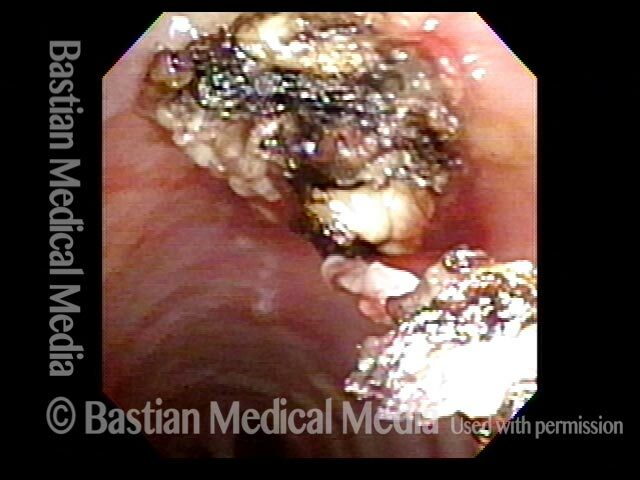 Papilloma on right vocal cord (left of photo), proven by biopsy elsewhere. The disease has both a projecting component along with 'carpet-variant' component seen only via stippled vascular marks (within dashed line). Closer view under strobe light; stippling is seen more clearly. Compare the stippling with the linear capillaries of the opposite cord. One week after removal and sub typing (HPV 6) and cidofovir injection. Under narrow band light there is residual bruising but no significant stippling. At final office-based cidofovir injection. Blood from the injection is seen, but still no stippling. Six months after removal, papillomas have recurred at the margin of the vocal cord, but not on its upper surface where linear capillaries have replaced stippling. A week after second removal of papillomas and cidofovir injection, with expected inflammation, but no visible remaining stippled vascularity. 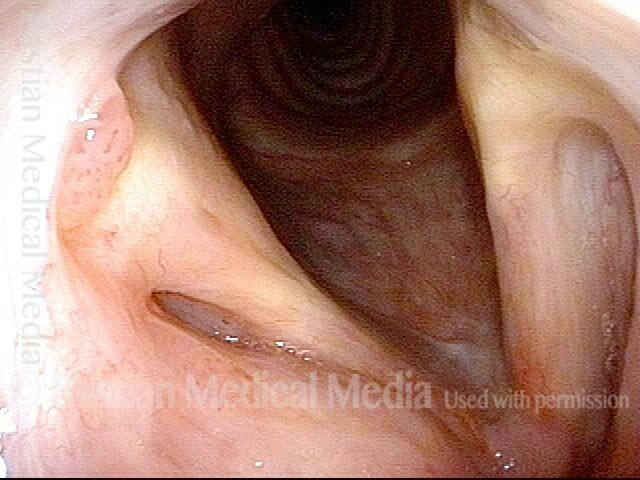 4 months later, the vocal cord has long since healed and narrow band light is used to accentuate capillaries. No HPV effect (stippling) is seen. 3 years later, there is still no sign of papilloma or stippled vascularity (HPV effect). Chronic hoarseness, due to these papillomas, subsequently proven to be caused by subtype 6. Note HPV-effect vascularity. A second surgery, 5 cidofovir injections (3 in office), and 4 months later, neither papilloma nor HPV vascular effect are seen here, under narrow band light. Now 8 months from the start of treatment, and 5 months since the final (office) cidofovir injection, there remains no evidence of abnormality. This view is under standard light. An even closer view under narrow band light still shows no sign of HPV effect or papilloma. Voice is normal and vibratory flexibility is maintained when examined under strobe light. This patient is representative of persons initially diagnosed with "polyps," based upon a view like this one. Now we can see that these lesions are papillomas by the powerful visual criterion of vascular stippling aka "HPV vascular effect." Another clue of incorrect diagnosis, even with a distant view, would be the patient's non-match with the vocal overdoer syndrome. Narrow band light at the same magnification accentuates the vascular stippling. Typical papillomas indicated by arrows, and faint lines online areas of "carpet variant" papillomas. 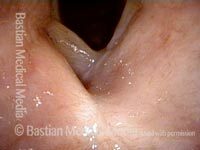 Prephonatory instant shows additionally that the right vocal cord lesion (left of photo) is in the wrong location for vibratory injury.